Please call the pub if you do not see availability online. 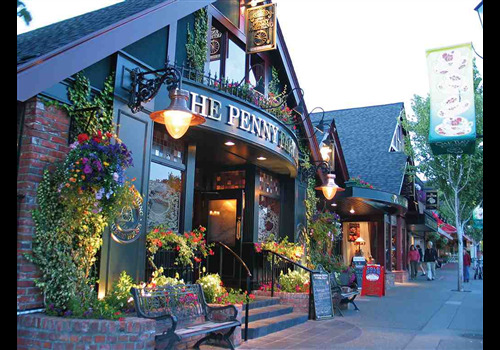 The Penny Farthing Pub takes its name from the innovative bicycle of the 1870's with an impossibly large front wheel coupled with a minuscule rear wheel. The immense height of the front wheel meant that the rider perched high above the street in order to both ride and control the bicycle. The name of the bicycle comes from two low-value historical British coins: the penny, a large, heavy round coin, and a farthing (worth a quarter penny), a much smaller and lighter round coin. The silhouette of the penny-farthing bicycle has come to represent the whimsical ambience and adventurous, playful spirit of the late Victorian period and turn of the 19th century.